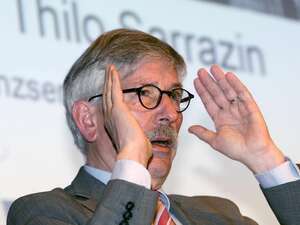 Turks and Arabs infiltrate us by a high birth rate and are largely useless - this Thilo Sarrazin's views, which he expressed in 2009, mutatis mutandis, the state had to go through as expression. Wrongly, now is the Anti-Racism Committee of the UN - and sets an ultimatum to Germany. Germany has been criticized by the Anti-Racism Committee of the United Nations because it Thilo Sarrazin 's controversial remarks about the Turks and Arabs have let it go. What had been considered by the local prosecutor's office as an expression of free speech, has been classified on the international level as racism. The failure of criminal investigations constitutes a breach of the UN Convention on the Elimination of All Forms of Racial Discrimination represents the Committee. When Turkish Association of Berlin-Brandenburg (TBB), on whose initiative this was happening, were pleased on Wednesday although the success, but will only say officially on Thursday at a specially appointed date something. What conclusions can be drawn from this complaint and what laws may need to be changed, which will be shown now, said a TBB employees. The UN anti-racism committee (CERD), Germany has given 90 days to comment on the issue, which measures the decision should be implemented. In addition, the opinion of the Committee must be made public. The Committee noted, it is not sufficient to explain racial discrimination in the paper illegal. The state must also effectively enforce this. He was obliged to protect the population against incitement to racial hatred. Who makes use of the right to freedom of expression, standing in the obligation not to disseminate racist ideas. The federal government responded initially reluctant. "The opinion of the Committee is before the Federal Ministry of Justice and will be checked," it said so. The history began in 2009. At that time, Sarrazin had made ​​derogatory remarks about Turks and Arabs in an interview with the magazine "Lettre International" and gave rise to a lively debate. Also, in his book "Germany abolishes itself" , which was released in August 2010 and became a bestseller, the SPD politician took his theses. At this time he had already resigned from the post of Berlin finance senator and had joined the board of the Bundesbank, from which he resigned in late September 2010. Sarrazin was accordingly expressed in the interview, Turks and Arabs would undermine Germany by many children they would get, they are dumber than a majority German and professional without promising perspective. For this purpose they would have no ambition, because the welfare system is to make them comfortable and give them abverlange too little. Sarrazin was harvested from parts of society applause from other outrage. The TBB presented a criminal complaint, the prosecutor terminated the procedure. A complaint of TBB rejected the Attorney General's Office. Then put the TBB in July 2010 when a complaint CERD. The Committee, for three weeks each meets twice a year in Geneva, made his decision on 26 February 2013. It was on the 4th April published. Sarrazin was not to reach by phone on Wednesday. The UN Anti-Discrimination Committee monitors compliance with the Convention. Its 18 members must be demonstrably independent and impartial. There are no Germans in the committee.